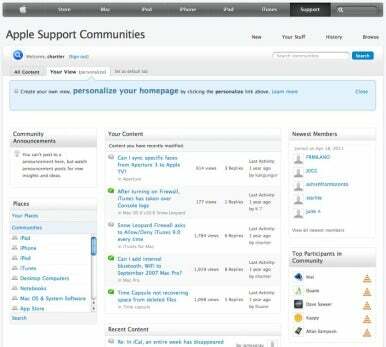 Eight months after announcing that a big revamp was on the way for its discussion forums, Apple has finally rolled out its new Apple Support Communities. Apple’s updated forum system places new emphases on the processes of asking and answering questions, product specificity, and personalization. While it still generally looks and acts like your typical discussion board, Apple has embraced the new trend of question-and-answer format that you see at sites like Quora, Facebook Questions, and of course Yahoo Answers. Upon finding the “community” (or product section) that you’re interested in browsing, you are now prompted to “ask your question” to see if the topic you’re interested in has already been covered. In fact, that question box is now the only way to create new threads. If you don’t find what you’re looking for in the list of real-time search results of existing threads, you can press on and submit your question as a new thread. Replies that are marked as the “correct answer” can float to the top of the first page (just like at most other question-based discussion systems) to make things easier on those who have the same problem, but just want the quick answer on how to solve it. If you want to view the discussion as it unfolded, though, you can still flip through a chronological view. A new customizable tab on the Support Communities main page, simply called Your View, allows you to keep a bird’s-eye view on important sections. You can create a sort of dashboard that contains the most recent unanswered questions, popular discussions, and specific products—say, the ones you own—for quick access. There are plenty of other changes in Apple’s new Support Communities, including the ability to specify a product on each new discussion, a quick search box to easily find the forum that you need, and a more in-depth optional profile. As you might expect from anything new and different, the Using Apple Support Communities area already has its fair share of complaints and negative feedback about the new format. You can learn more about all the changes Apple made on the Support Communities Welcome Page. If you take the redesigned system for a spin, let us know what you think.